Happy Poetry Friday! See the link at the end of this post to this week's round-up. I'm not sharing a poem today. Instead, I'm continuing our current discussion on creativity. As Jill said in Monday's post: "Creativity is tough to define and tougher still to write about." I agree! "Creativity: The use of the imagination or original ideas, especially in the production of an artistic work." I came across this E. B. 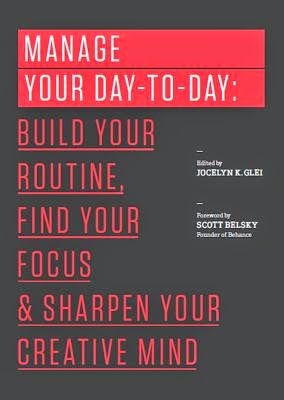 White quote in a book I read recently: Manage Your Day-to-Day: Build Your Routine, Find Your Focus & Sharpen Your Creative Mind, (Amazon Publishing) edited by Jocelyn K. Glei of 99u. The book is a compilation of quotes, interviews, and essays from experts in productivity and creativity. Interestingly, the tips often overlap with those in the article Jill linked to: "The Psychology of Writing and the Cognitive Science of the Perfect Daily Routine" by Maria Popova. "Do your most meaningful creative work at the beginning of your day, and leave 'reactive work'—like responding to e-mail or other messages—for later." I recently made a rule for myself: No email before 10 a.m. It's been amazing to me how much this one simple rule has helped. Now instead of getting lost in email for an hour or more at the start of my day, I get lost in my current work-in-progress. Yay! I also have a second, related rule: check email no more than three times per day. This has really helped me be more focused and efficient when I do check email. "Establish 'associative triggers'—such as listening to the same music or arranging your desk in a certain way—that tell your mind it’s time to get down to work." I call my "associative triggers" my "writing rituals" and I shared them last March when we did a series of posts about our writing routines. "Commit to working on your project at consistent intervals—ideally every day—to build creative muscle and momentum over time." In the post on my writing rituals, I talked about how I was in the middle of a "100-day, one hundred words a day (OHWAD) writing challenge." That worked at the time because I was writing a first draft. Now that I'm revising, I've modified it to a "100-day, fifteen minutes a day (FMAD)" challenge. I've committed to work at least 15 minutes/day, six days a week for 100 days. (I don't count my days off in the total.) I deliberately chose a very doable goal--15 minutes--that I could accomplish even when I have a day filled with other commitments. The challenge is working well for me so far: I began revising Chapter One on Day 1. Today is Day 27, and I'm now up to working on Chapter Eight. "Make your daily achievements visible by saving iterations, posting milestones, or keeping a daily journal." On Day 1 of my FMAD challenge I created a table in a Word document called Revision Log. In that document, I note such statistics as my start time, time spent, starting page and chapter, ending page and chapter, starting word count, and ending word count. Looking at my log now, I can see that my writing sessions have ranged from 20 minutes to over 2 hours. Without doing the math, I'd guess that I average about an hour a day. (If I wanted to get really fancy, I could put the stats into a spreadsheet and let it calculate my productivity rate.) For me, this log is a great psychological boost because I often fall into the trap of thinking my writing isn't going anywhere when in fact I am making slow, but steady, progress. These are just four of the suggestions in Manage Your Day-to-Day that have helped me. Even if none of these ideas appeal to you, I hope that my sharing them here will nudge you into thinking about how to support your own creativity. Are you already happy with your routine/process? If so, we'd love to know what works for you. Please tell us via the comments. I'll leave you with one last quote, from Jonah Lehrer's Wall Street Journal article "How To Be Creative:"
"But creativity is not magic, and there's no such thing as a creative type. Creativity is not a trait that we inherit in our genes or a blessing bestowed by the angels. It's a skill. Anyone can learn to be creative and to get better at it." Lehrer's article ends with "10 Quick Creativity Hacks" you may be interested in checking out. And for ten tips on how to write more regularly, see "How to Create the Habit of Writing" by Leo Babauta at Write to Done. Reminder: Today's the last day to enter for a chance to win an autographed copy of Barbara Krasner’s picture book biography Goldie Takes a Stand (Kar-Ben Publishing)! Now you can head over to be inspired by all the Poetry Friday poems. This week's round-up is at former TeachingAuthor Laura Salas's blog. One of the links there is to a post at Today's Little Ditty in which Michelle Heidenrich Barnes shares a fun little poem by our own April Halprin Wayland! Carmela, This is a great and useful post and one I need about now. Thank you for your thoughts here today and for your links back too. Happy Poetry Friday! Best, a.
Glad to help, Amy. Let us know if you try any of these techniques. And Happy Poetry Friday to you, too! Luv this topic, as I was not so creative for some of the summer in my writing & entire world, more lazy, I feel & then the artistic/creative muse returned with September. reading silly books to Kindergarten kiddos & leading them in songs. Appreciations for your accenting this idea. Thanks for these reminders--I used to do #1, and I have let that slide lately. Making a new vow to put my "creation of new work" time in the first time slot of each work day. Thanks for stopping by, Laura. Good luck with your new vow!